Certain Church hunters obfuscate their identities and slip into the nooks and crannies of the city. This is the garb that allows these harrowed individuals to go unnoticed. These hunters are keen to early signs of the scourge, serving as a first line of defense against its outbreak. Or perhaps, when the time is ripe, they find signs of the scourge where there are none. It just goes to show, the corner beggar is not always who he seems. 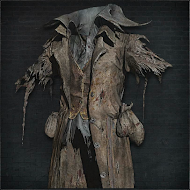 Harrowed Set has the highest Physical defense of all armor sets. 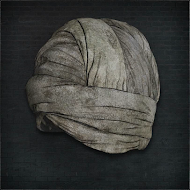 Harrowed Hood has one of the highest Physical defense and Rapid Poison resistance of all head pieces. Harrowed Garb has one of the highest Physical defense of all chest pieces. 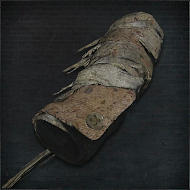 Harrowed Gloves have one of the highest Physical defence, the highest Slow Poison and one of the highest Rapid Poison resistance of all Hand pieces. 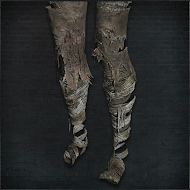 Harrowed Trousers have one of the highest Physical defense and the highest Slow Poison resistance of all Leg pieces.